Here are some great tips and information to keep your strawberry plants in top shape. 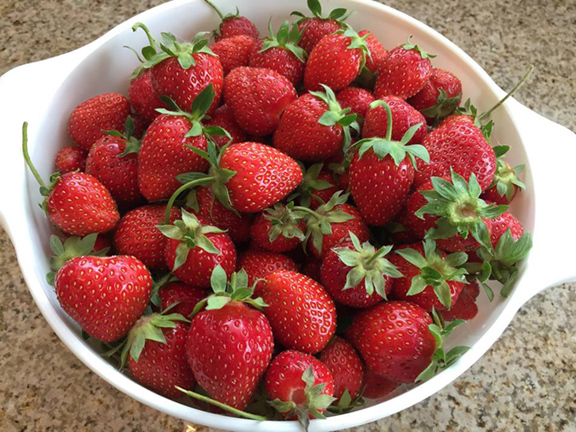 Light Strawberries require at least 10 hours of full sun daily. Soil Fertile, well-drained soil preferred. Planting Work soil 8-12″ deep with organic matter such as mushroom compost or peat moss. Mound rows 6-8″ high by 12-18″ wide. If your soil is clay-heavy, consider a raised bed for your strawberries. Spacing Plant 1 foot apart in staggered rows. Allow 2 feet between rows. Mulch Add thin layer of mulch to cool the soil, conserve water and prevent weeds. Watering Water well after planting. Established plants generally require 1″ of water per week. Feeding Feed with a well balanced 10-10-10 fertilizer each spring. Care Remove runners from spring through July in the first growing season, so a strong root system is established. In mid-August , allow each plant to develop 1 or 2 runners. Original plant will produce for 3 years. Covering with garden netting will prevent birds and critters from tasting the berries. Picking Harvest when the berries are red. Pick every other day or so… and enjoy! Remove original and allow secondary plants to grow. Winterize Mulch with straw or chopped leaves after several hard frosts when ground is frozen. Uncover in early spring when groud begins to thaw.